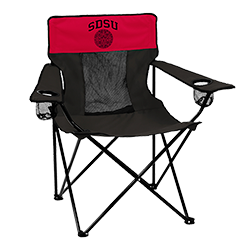 Red & black collapsible chair with carrying bag and ratractable cup holders, featuring SDSU with the Aztec Calendar screen printed on the front & back. Chair has 250 lb. weight capacity. Not eligible for free shipping or international shipping. A $15 oversized shipping fee (per chair) will be added when your order is fulfilled.